This tutorial will demonstrate how to easily turn your Raspberry Pi into a physical Gmail notifier, in only 10 lines of python! If the configured Gmail account has unread messages, the LED will be illuminated, otherwise dim. The project was inspired by the Arduino/Mac version by J4mie adapted for use on the Raspberry Pi. That’s it! From now on, cron will execute the script once every minute. If you have unread messages, the GPIO pin will be pulled high, lighting the LED, otherwise, it will be disabled, dimming the LED. frustrating, it’d be great if I could get this to work, looks great! I suspect your problem is in the line above the if statement… The colon is needed for valid Python syntax. Try adding print newmails above the if statement to check the return value from the feedparser function call. Thanks for catching the error… I have updated the tutorial to reflect the changes! Minor clarification: I had the same problem, but I had to fix it by installing python2.7-dev (not python-dev). Also, in order for pip to function properly (requires >=0.6.27), I had to run “easy_install -U distribute” before the above commands to update it. Thanks for pointing out this issue… The article has been updated accordingly! Thank you very much for this article — there are a number of similar articles that are wrong, but this worked great for me! Glad to hear you found it useful Ben! Just FYI, on the latest release it looks like the GPIO states are not persistent. So as soon as the python script exits, the light goes out. This took me a while to figure out, but hopefully will help others! Thanks for sharing Dan, at the time of the writing, the states remained persistent after script exit! 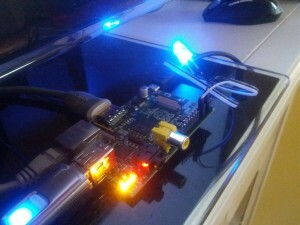 I’m real beginner in the world of RPi and I’m french, so please excuse my poor english!! Hi Jack, are you importing the RPi.GPIO as GPIO? If your import statement uses the default naming (ie import RPi.GPIO instead of import RPi.GPIO as GPIO) this would cause your NameError above. I whant to know how you connected the wires. because in the picture I see no resistor. A scheme it would be very helpful. Thanks! I took your great starting point to build a notifier which announces the senders of unread emails using Morse Code. Good fun mixing leading- and trailing-edge technologies! Glad to hear you found it useful! Also, thanks for sharing your Morse Code project… very nice work! How do you connect the LED ? Directly without resistance ? Hi chatainsm, the LED is connected to the Pi with a 330 ohm resistor in series. I added a Fritizing diagram to the article for clarification. As soon as I add the Python Script to the Raspberry Pi, and run it, I get a syntax error as follows: “SyntaxError: invalid character in identitfier”. It also highlights the dot in RPi.GPIO. What is wrong here?? Hi Michael 🙂 firstly thanks for all the guides. Very helpful. However, i’m faced with a error. This appears when i paste Huge chunk of python script. What does this mean and what do it do now? Hey, I like the project but when i easy_install, it doesnt work. Im not sure howto fix this. Got this working with GPIO but it doesn’t find the shell script when I run it with ‘shell’ or ‘bash’. Should the scripts be in the same directory as the program (raspiBot.py) or in the /home/pi directory? I don’t find them in either place. 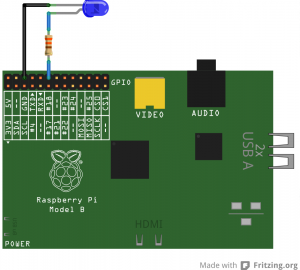 Could u post the code in c for email notifier project on raspberry pi? Great tutorial. Do you know how we would use feedparser to find the email subject. I want to run a command when I email a new gmail inbox I’ve set up. This way, I can run the script from anywhere. Is there a way to make this work with hotmail? Thanks for this! I’d been playing with Adafruit’s code that runs in a While loop that checks every minute. For whatever reason, it would only run for a few hours and then stop working. Granted, remoting into the Pi to restart the Python script is trivial, but annoying. So, I started by asking Google about how to troubleshoot it. I’d figured I’d have to put a watchdog in cron to make sure it was always running. When I saw you running the Python code itself from cron, I had a pretty hard facepalm moment. That was.. uh.. fun? Ha. I’ve built on the idea (Gmail checker), and have it not only checking, but also telling me how many unread messages are in my inbox, using a 7-segment display (also from Adafruit). Here’s a brief clip showing it in action: http://youtu.be/Gq6wY9A1pbU – it’s running once a minute via cron, based on your example. Is it possible to setup a encrypted password in the python script? I was jsut wondering if you had any idea of how you would go about coding the Raspberry Pi to send a SMS message to your phone if you recieve an ‘Out of Office’ after sending an email to someone? Or getting the LED to turn on if getting that same ‘Out of Office’ response? so use a email setup in python such at smmtp to text your phone if something happens that you list. Pin and Yes, I had to add sudo so it would execute correctly. So what’s wrong? Yes, the LED is dim. Hey, Micheal, maybe gmail handles your newmails line differently now!? Just wanted to thank you for this, Adafruit has a similar tutorial but it didn’t work for me but this did. Small note, I did have to enable “less secure devices to connect” in google settings, but once I did, it worked great!